The Right House in Charleston - Know When You've Found It! Home shopping can be both exciting and stressful. You will likely view many homes, and you will find pros and cons with every one you see. So how do you go about making the right decision? How do you know when you have found the right house in Charleston? In our latest post, we will help you consider some key factors to finding the perfect home. While a buyers agent can help you navigate the home buying process, we recommend doing as much research as possible on your own. You don’t want to find yourself stuck with an agent, or looking at only one type of property. 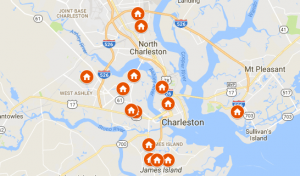 Consider your multiple purchasing options before deciding on a property to buy in Charleston. This is what you should refer back to at all times. On this list, write out the things you want to see in a property. Separate these things between wants and needs. Get input from your family and consider the things that will make everyone happy. These things go at the top of the list. If you really want a large porch, but realize it’s not a necessity, move it to the “wants” section. Sure you might find a house with a mudroom and realize you “need” this in your life. However, if it isn’t on your initial list of must-haves, you can probably do without it. Also on this list, consider things such as commute times and school bus schedules. If you are not willing to commute more than 30 minutes, write that down and stick to it. You will likely regret budging on the commute time when you find yourself sitting in traffic for an hour each day on your way home. You should have a strict budget when buying a home and aim to spend even less than you’ve set aside. Make sure you take note that owning a home is much more than a mortgage payment. There are taxes, insurance and maintenance expenses you might not have had before. Your utility costs might be higher than in your previous home and you will likely want to make some changes to the house before moving in. You should budget for all of these things, including a reserve for the unknown. You don’t want to purchase a house, only to find you are in over your head. If you are on a quest to find the right Charleston house, you will leave no stone unturned. You will consider properties on the MLS as well as off-market properties that aren’t always available to the general public. Working with a company such as D Gilpin Properties will help you to find these off-market properties that can ultimately be excellent Charleston investments. When you are buying a house, you are buying into the area in which it is located. Sure, you don’t want to have to do a ton of work to make the house what you want, however, walls can be torn down, rooms added and pools dug. However, you can’t change the location of a home. You should really love the neighborhood. It should be a great place for you and everyone who lives under your roof. Are you looking for great schools? For family recreation? Think about whats important in the neighborhood before making a purchase!